So, at 2-2 in games following a 3-0 Detroit victory over Phoenix in Hockeytown, are the Wings finally in charge of this opening round Stanley Cup series? With the series down to a best-of-three with two of the games in Phoenix, if Home Ice Rules, the Coyotes win in seven. Of course, home ice hasn’t ruled; both teams have a win in the other’s building. Then there’s the Hockeytown Special: The Wings win in Phoenix Friday and at home on Sunday to win in six. And then there’s looking at Tuesday’s shutout as the Wings’ Last Hurrah: The Coyotes win at home and win the series in Hockeytown. This one scares me. The Coyotes play like hungry dogs. They lack the Wings’ star power, know it and play with the kind of desperation that trumps talent in the playoffs. Two of these three scenarios favor the Coyotes; the series is best two-out-of-three now. Will the Wings’ talent trump the Coyotes’ hunger? You won’t find the answers here. We’ll see them on the ice. What I liked about the game: Quite a bit, really. Joe Louis Arena was noisy. The crowd helped because the Wings helped the crowd by playing well. The Wings hung in there. They killed six more power plays and have not given up an extra-strength goal since the three in the first game. Five of the last six penalties in the game were against Detroit; the Wings had to kill back-to-back penalties at 10:20 and 12:02 of the third period, which means they played 18 seconds down two men (AND lost the faceoff in their own zone to start those 18 seconds). So, three things won this game: penalty killing; goalie Jimmy Howard, who made 29 saves; and the Wings best two players scored. Henrik Zetterberg scored the first (at 15:33 of the second period) and third goals of the game; he now has five goals in the series. 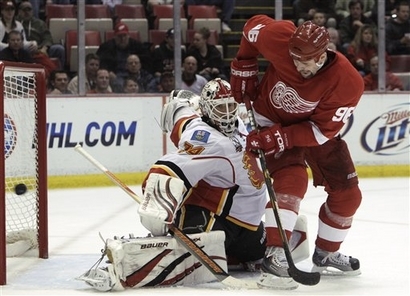 Pavel Datsyuk scored the killer second goal after the Wings killed off the back-to-back penalties. What I did’t like about the game: Faceoffs continue to be a concern. The Coyotes dominated the first period 20-7, yet the Wings finished with a 31-30 advantage, 24-11 in the last two periods. Also: The Wings continue to chase the pucks for shifts on end at times. The Coyotes really move the puck well. And you can expect to see more of that on Friday. Also: Even without their best player, Shane Doan, the Coyotes were in this game until the final five minutes. The BIG question: The three scenarios at the top of this posting. What an opposing goalie looks like after his first win. It’s a sports cliche: Some wins feel like a loss. And vice versa. This was a vice versa. The Oilers had the Wings beat for 59 minutes, 59.8 seconds Friday night in Edmonton. But it really is a 60-minute game (yet another cliche), as Brian Rafalski proved with .2 tenths of a second to play, tying the game at 2. Unfortunately for the Wings, 65-minute plus games are not their forte, and the Oilers won the game in a shootout, 2-1. Score: Oilers 3, Wings 2 SO. Game #70 (12 games to play, 24 points), 81 points, tied for 8th place, but with one game in hand on Calgary, which beat San Jose (drat! ), 4-3. The Wings are 4 points behind Nashville (with a game in hand) and Los Angeles (they have a game in hand) and 5 behind Colorado (same number of games). But with a second game in two nights Saturday in Vancouver, the Wings immediate concern is pulling away from Calgary if they can. Time is running out. What I liked about the game: In the final battle for the puck in the corner to the right of Edmonton rookie goalie Devan Dubnyk, Henrik Zetterberg dug out the puck to Pavel Datsyuk, who threaded the quick pass to Rafalski just in front to Dubnyk’s left. … Jimmy Howard‘s 60.2-minute shutout after a tough start. What I didn’t like about the game: Terrible, terrible way to start the game against a bad team, down 2-0 5 minutes into the game. If the Wings squeak into the playoffs (and they haven’t missed since 1989), that may have been the point. Of course, if they miss the playoffs for the first time in three decades, they left the points on the table against the worst team in the league. The Wings are 6-12 in OT this year. Do the math: If Detroit is 12-6, golly, they’re in 5th place. Also: NOTE to Gary Bettman, who I’m sure doesn’t read this blog: Why does an ET team have to play so many 9:30 and 10:30 MT and PT games as a member of the Western Conference? The BIG question: Why are the Wings 0-2-1 against the Oilers this season? Jimmy Howard is the Wings' MVP this season. So let’s not get carried away here. The Red Wings are 8th again the Western Conference, 1 point ahead of the Fames (who have a game in hand they’ll play tonight in Vancouver), 1 point behind 7th-place Nashville and — are you ready for this? — 4 points behind 6th-place Colorado! That all works the other way, too, of course. Calgary could be back in 8th by the time I wake up Monday morning, and 10th-place St. Louis is hanging on just 5 points behind with a game in hand. Huge, huge, huge payback game for the Wings Monday night in Calgary. The Saddledome will be rocking. The Wings owe the Flames a snuffing after last week’s 4-2 come-from-behind Calgary victory (remember those 3 goals in the third period?). Game #68 (14 to play, 28 points), 78 points, 8th place. What I liked about the game: I liked the way the Wings played from the git-go. They were really moving their feet, putting passes on the tape. 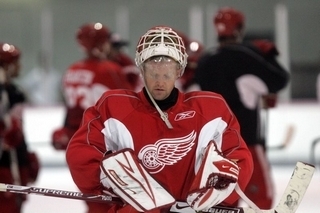 Jimmy Howard’s goaltending was important. Pavel Datsyuk was a bundle of energy … I keep wondering whether Brian Rafalski‘s role with the Wings allows him to be the often dominant player we saw in the Olympics for Team USA. His winning OT blast against the Sabres was exactly what I’ve been looking for this season. 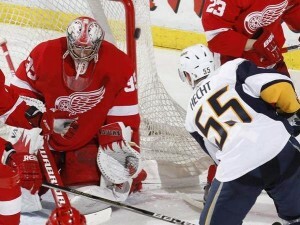 What I didn’t like about the game: Ryan Miller should be a Red Wing. Someday, maybe … Another 2-goal lead, another struggle to put away a game. But this time, the Wings didn’t blow it. The BIG question: Calgary on Monday. Last week’s game (and loss) was big. This is in the huge category. Quote I: “It was a huge win.” — Jimmy Howard, who made 24 saves. Mood meter: Lift a brew to Miller time.